The name Lakeland has been synonymous with land surveying for over 50 years, with current management being in place for the last 10 years. Previously known as a small regional firm, Lakeland Surveying, Inc has grown into a statewide professional firm servicing all 21 counties in New Jersey. We utilize leading edge technology, including state of the art robotic total stations, GPS systems and the latest in software solutions. Lakeland Surveying provides a wide range of surveying services for property owners, municipalities, and real estate attorneys, as well as engineering, title, and insurance companies. 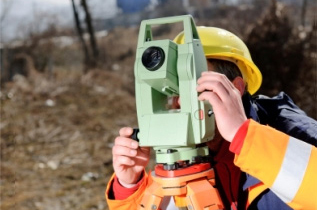 Whether you require a boundary survey, a flood elevation certificate, condominium certification, a topographical survey or any other surveying service, Lakeland Surveying, Inc. is able to provide our clients with the highest level of professionalism and accuracy in a timely manner. Contact us today to request a free surveying quote. Lakeland Surveying is pleased to announce we have acquired the records of Frederick Loede, Jr. PLS. Mr. Loede had a long and successful career surveying primarily in Sussex, Warren and Hunterdon Counties and provides Lakeland Surveying with a valuable addition to our already extensive library of historical survey records. Included with the works of Mr. Loede are the records of Wayne Phillips of Hackettstown, NJ. Lakeland Surveying is excited to announce that we are expanding our business into the state of New York. Service areas will include Rockland, Orange, Putnam Ulster and Westchester Counties as well as Queens, Brooklyn and Staten Island. Adding to all 21 counties in New Jersey that are currently being served, this will allow Lakeland to continue its 15 year pattern of growth while maintaining the same level of service and professionalism that has earned the highest ratings from Home Advisor and Angie’s List. Lakeland Surveying, Inc. is proud to announce that they have acquired the historical survey records of Hulse Land Surveying and Wilbur (W.L.) Hulse, formerly of Blairstown, Warren County. Bill was a well known and highly respected surveyor with a record of accuracy and reliability in the industry. “My files are now in better hands. Good luck to you and Lakeland Surveying,” Bill recently wrote after the purchase. Lakeland Surveying, Inc. is extremely proud to announce the acquisition of the survey records of SmithSurveying, Inc. and Richard F. Smith, Jr. of Morristown, Morris County. Since 1980, Mr. Smith has been a fixture in New Jersey’s Land Surveying industry and achieved the highest level of respect among his peers and customers. Throughout the years, Mr. Smith developed an extensive catalog of land records, some dating back hundreds of years. Those will prove to be an important asset as Lakeland Surveying strives to be New Jersey’s premier land surveying company with the largest library of historical survey records. Lakeland Surveying, Inc. is proud to announce the acquisition of the survey records of Azimuth Land Surveying and William (Bill) Zieman, Jr. Mr. Zieman , through decades of work was well known in the Monmouth and Ocean County areas. Equally important is the addition of Debbie Wirth, former partner to Mr. Zieman to the Lakeland family. Ms. Wirth has many years of surveying experience both in the field and the office. “As Lakeland Surveying continues to grow, we are excited to have an asset such as Debbie to expand our reach to all areas of New Jersey while continuing our record of customer service,” says Marc Cifone, president of Lakeland Surveying. Barnegat, NJ. Lakeland Surveying, Inc. is proud to announce the opening of a new field office at 307 South Main Street, Barnegat, NJ. This new location will help Lakeland maintain the goal of servicing all of New Jersey in a professional and timely manner and continue providing survey services to an area greatly in need of qualified professionals. Lakeland Surveying, Inc. is currently performing work for numerous RREM approved builders from Cape May County to Middlesex County in the effort to rebuild after Superstorm Sandy. Toms River, NJ. Today Lakeland Surveying, Inc. acquired the surveying records of Gannon, Loveman and Keppler, formerly of Toms River, NJ. These surveying records include those of Peter J. Gannon, George B. Loveman and George F. Keppler and consist of over thirty years of historical survey records throughout Ocean County, Monmouth County, Atlantic County and Burlington County, New Jersey. We are proud of our reputation. Click here to read what our satisfied NJ surveying customers have to say about working with us.